As life goes on our collective tastes can change. 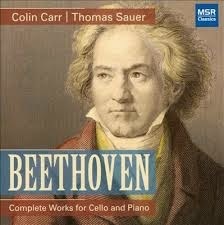 I have two versions of Beethoven's Music for Cello and Piano. Both were recorded a considerable time ago by now. One is by Pablo Casals, the other by Mstislav Rostropovich. Both are excellent, yet in emotional terms, especially the Casals, they have a certain expressive quality that impresses but perhaps does not shed a balanced light on the beauty of these seminal Beethoven compositions. So when I heard a recent version by Colin Carr on the cello and Thomas Sauer on piano (MSR Classics 1486 2-CDs) I found myself highly satisfied with the middle-ground the duo occupy. They are expressive as the music demands, very much so, and there is power and motility in their interpretations. But they are never emotionally over-the-top, though clearly they are excellent players. There were generations of players who took their cue in romanticism from the extreme fire and passion of Beethoven's 9th. Now everything before and after that milestone is not necessarily meant to be played in extremis, a little bit less helps give proportion to the music, which in the case of Beethoven's works for cello and piano lie as much in the brilliant structure-in-motion of the music as it does in sentiments expressed. And so while I will continue to listen to and cherish the Casals and the Rostropovich, Carr and Sauer give us a contemporary balance that wears well today, an everyday-workaday yet brilliant set of readings that puts everything into focus.